Good to know I'm not the only one bemoaning the Johnson County Board of Commissioners' proposed slap in the face, err, tax increase. Americans for Prosperity-Kansas has decided to rally its troops. 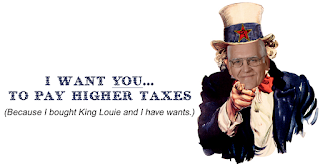 I just received an email urging me to call or email my county commissioner and tell him I don't want a tax increase. Consider it done, AFP-KS. You know who SHOULD hear from Republicans? Ed Eilert and Jason Osterhaus. We probably don't have to worry about how Michael Ashcraft and John Toplikar will vote. They'll get it right. Commissioners Steve Klika and Jim Allen will get it wrong. No question. Ron Shaffer probably will, too, but his stint on the commission is so short, I hate to make a bad assumption based solely on his performance as Prairie Village Mayor. While we're on the topic: Any Johnson County Republicans who publicly supported Eilert over Patricia Lightner for county chair in the last election should be shamed, loudly and often. (Ahem. Jason Osterhaus.) You know what we don't own if Lightner is chair of the commission? King Louie. And while it makes me uncomfortable to say this, it may be time for Osterhaus to seek a role outside of public service. Many of his commission votes of late have been, well, liberal-leaning. He's "growing in office," and conservatives should be terrified. Johnson County has already budgeted for a property valuation increase of 6.25%. Now, the Johnson County Commission is considering raising the mill levy by 6.79% to raise an additional $13.7 million in new taxes. That's a tax hike of more than 13% in just one year. County officials have claimed that without a mill levy increase, county services will have to be cut. This does just not add up. The proposed 2016 budget will increase County spending more than $28 million (4%) over last year. Without the $13.7 million from a tax hike, the county could still increase spending $18.5 million (2%)...without any cuts in services or a mill levy hike. Johnson County doesn't have a revenue problem, it has a spending problem. 2% growth in a single year is plenty. Johnson County Commissioners will vote on the proposed budget Thursday, August 13th. We encourage you to let your Commissioner know what your thoughts about the mill levy hike, and your priorities for government services. Please click the button here to contact your commissioners, and let them know you don't want a tax increase. Clicking the button allows you to send a form letter. I suggest a personal email will be more effective. Here, you can find links to your commissioners' email address. You can also click on their names above and send an email. If you haven't already voiced your displeasure at their suggestion that a 14 percent tax increase is warranted, do it now. They vote on Aug. 13.